Lincoln is bringing back the Continental name for its new flagship sedan in a powerful and symbolic move that signals the true commitment Ford is making to reviving its luxury brand. The new flagship blows apart some Lincoln signatures of recent years, dropping the MKS name of the current top model and showing a completely new Lincoln look and presence. The sedan will be displayed as a concept this week at the New York Auto Show. Ford’s once-dominant luxury brand was allowed to wither and attempts to revive it have fallen short of what is needed to elevate Lincoln to a top-tier luxury player. Its very viability has been questioned over the years. But new Ford CEO Mark Fields is drawing a line in the sand. While the luxury segment represents 10% to 13% of U.S. market sales and only 6% of the Chinese market, these vehicles generate a third of the profits. And their sales growth is outpacing the rest of the industry. He evoked the Continental name to motivate the team behind the concept. The first Continental was a one-off personal vehicle for Edsel Ford, and three signature designs in the ’40s, ’50s and ’60s cast a halo over the entire Ford Motor Company. Bringing back the Continental name was not the original plan. Designers and engineers had been working on a much-needed new flagship to punctuate Lincoln’s revival in the U.S. and herald its entry into the critical China luxury market. “To be honest, we struggled with the specialness,” Scott Tobin, Lincoln’s director of product development, said. “We had a couple themes. None were hitting the mark.” They were not going to pass the Fields’ “wow” test. “The first couple of design iterations, we weren’t getting that mojo,” Fields said. So one day, in late 2013, he and then-marketing chief Jim Farley showed up for a design briefing. “They said, ‘Maybe this will crystallize it for you. You’re working on the next Continental,’ ” Tobin recalls. “It reset the design team,” said David Woodhouse, Lincoln’s design chief. It evoked both adrenaline and fear. But it also focused the designers because they had a heritage to work with. They drew from the great Continentals for inspiration but not design cures. This was not going to be a retro car. It only took about three months to nail down the new design direction and Fields was pleased with the result. The Continental introduces a Lincoln-logo mesh grille, chromed headlights, fine materials, disguised door handles and a rear seat fit for a king. The show car has deep pile carpet and a silken headliner. Alcantara suede rear seats with footrests extend into space created by pushing the front passenger seat up to the dashboard. Briefcases are integrated into the seat backs for storage. Push a button and a mirrored tray table with built-in tablet swivels over your lap. The champagne cupholders remain intact. 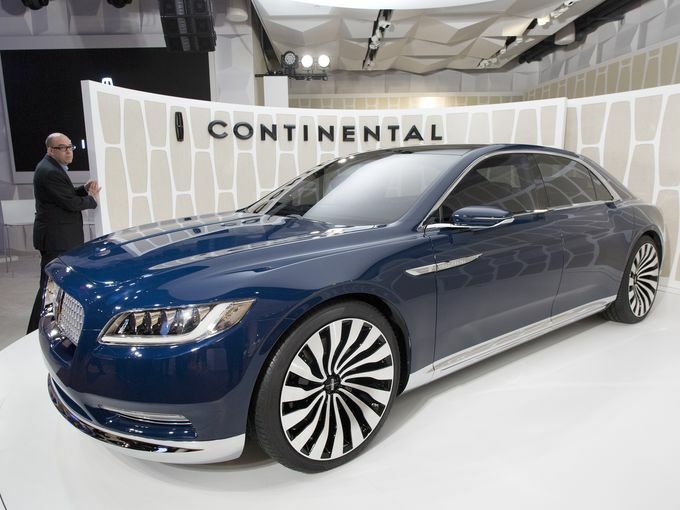 Fields said the new Continental completes the first generation of Lincoln’s rebirth that started with the MKZ in 2012, even though the new sedan bears little family resemblance to the MKZ, MKC or MKX. The next phase will see the redo of the existing lineup and add two new nameplates by 2020. Most are expected to come from a new and highly versatile premium vehicle platform capable of producing rear-wheel-drive vehicles as well as front- and all-wheel drive. Fields would not comment on the platform known internally as D6 that could yield an even larger rear-drive sedan to compete with the Audi A8 and BMW 7-Series and a large crossover to replace the slow-selling MKT. “For where we are at this point in our journey, it (Continental) will be our flagship, ” Fields said, not ruling out how far the brand could evolve. With the new platform still a few years out, the expectation is the Continental will be built on a stretched version of the global platform that underpins a number of vehicles including the MKZ and the new Ford Edge. That means front drive with all-wheel-drive capability. Further details will be revealed this fall. The Continental will have a new 3-liter twin-turbocharged V6 engine that is unique to the Lincoln brand. Investors were told in September Lincoln would spend $2.5 billion through 2019 to develop new products and retool plants to build them. That is just the capital investment amount, not counting advertising and launch costs, Fields said. The goal: triple the brand’s global sales to 300,000 by 2020. U.S. sales were less than 82,000 last year, a far cry from 1998 when Lincoln was the biggest luxury brand in the U.S. with sales of more than 187,000. Sales in China are in their infancy with 11 dealerships now and 25 planned by year’s end, but they are already selling 10% more than forecast, said Matt VanDyke, director of global Lincoln marketing. Fields said the Continental name has a lot of equity in the U.S. as well as in China where there is great awareness of U.S. history and the Lincoln brand. The Continental’s new grille is the new design that will spread across the entire lineup, Woodhouse said. While some of the elaborate touches added to the production car to create a concept for the New York show aren’t realistic, the car is largely production ready. The size, including the massive rear seat space, is the one that will be sold in both North America and China, Fields said. New face of Lincoln includes a grille with the logo replicated in mesh. Gone is the horizontal split grille.